Author's Notes: This guide is incomplete and contains some guesswork by me and my friends. It will be updated as frequently as needed. I'm looking for many more pictures and any more information. If you have information or photos to add please let me know! This post is for informational purposes only and I mean no disrespect by using the images in it - I'm am actively seeking to give credit on any images that don't currently have it. However, if I have listed photos that are yours and you'd rather me not use them in this informational post please let me know and I will remove them. Also, if I have used your photo and you would like for me to list credit please just tell me and I will add it immediately. Thanks! 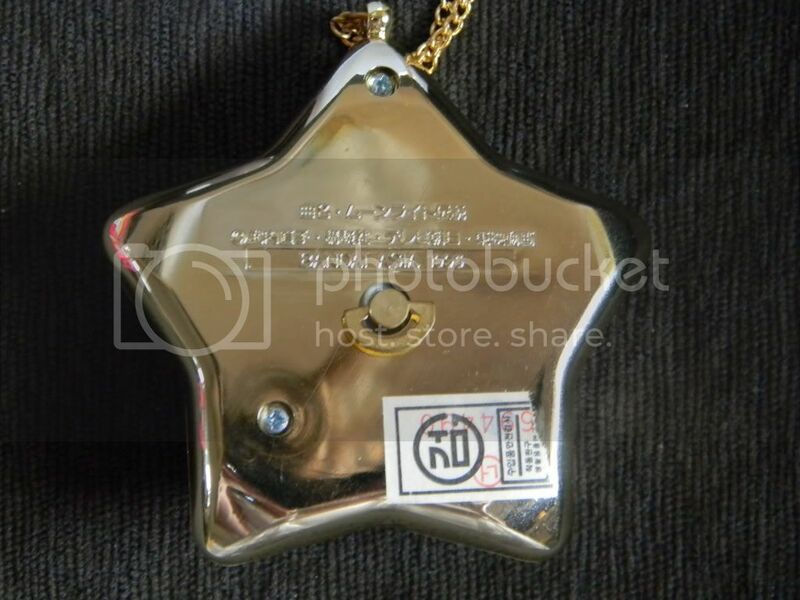 The elusive and desirable Starry Sky Orgel, most commonly referred to as the Star Locket. 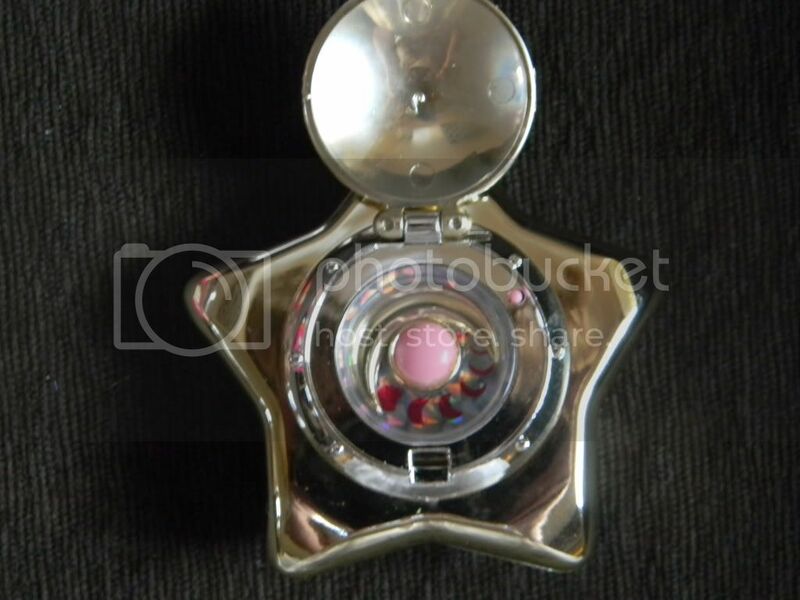 It is one of the ultimate shiny things in the realm of shiny things for Sailormoon collectors. We seek it, we long for it, we hunt it; sometimes we shell out hundreds of dollars for it. It's not the most expensive or rare item one could acquire, but something about the Star Locket entices us. Is it the symbolism because of it's importance in the story we love? Is it the little plink-plink sound the spinning barrel makes while playing that just-a-bit-too-fast tune? It's all of that, of course. It's just magical! When I first started seeking this shiny I was pretty confused. Even after having owned two of them and seen many others in collections, I remain slightly confused about how many different versions of this toy were made. 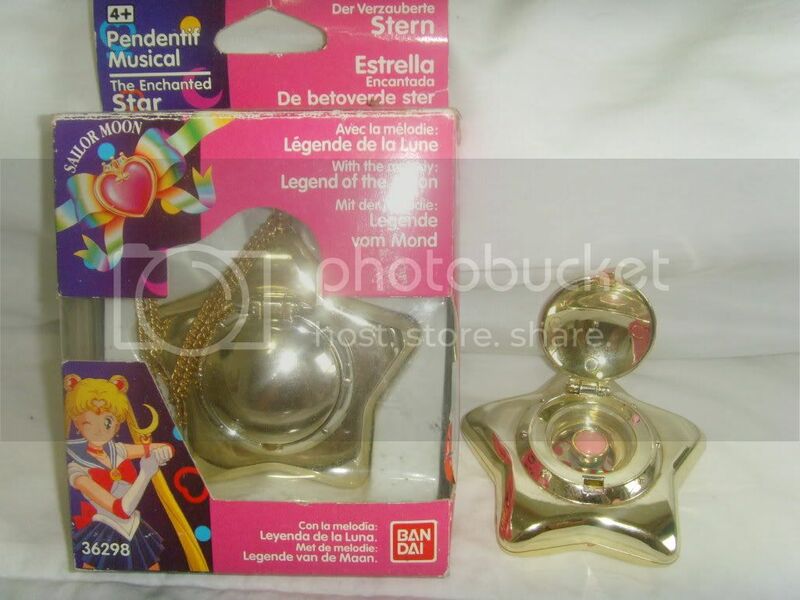 To try to sort out my understanding of it and to share this information with other collectors, I am making this post to document what I know and have seen about all the versions of the lovely Star Locket. Please feel free to contribute your knowledge too! The original Starry Sky Orgel was released in Japan the same year as the manga, 1992. The toy was made in Japan and sold in Japan. Like all the Orgels, it is a gold star shaped locket with a round lid that opens up revealing a pink gem nestled beside a gold moon. When you turn the key on the bottom of the locket, the gold moon spins around a silvery holographic background with pink phases of the moon on it. The original Japanese locket is very gold in color when compared to its European or Hong Kong counterparts. The ring around the lid is slightly less gold in color. This locket has no marking on the underside of the lid. The box for it is a reddish pink color and the writing is all in Japanese. The Bandai sticker (if present) will be on the upper left of the part of the box that sticks up. 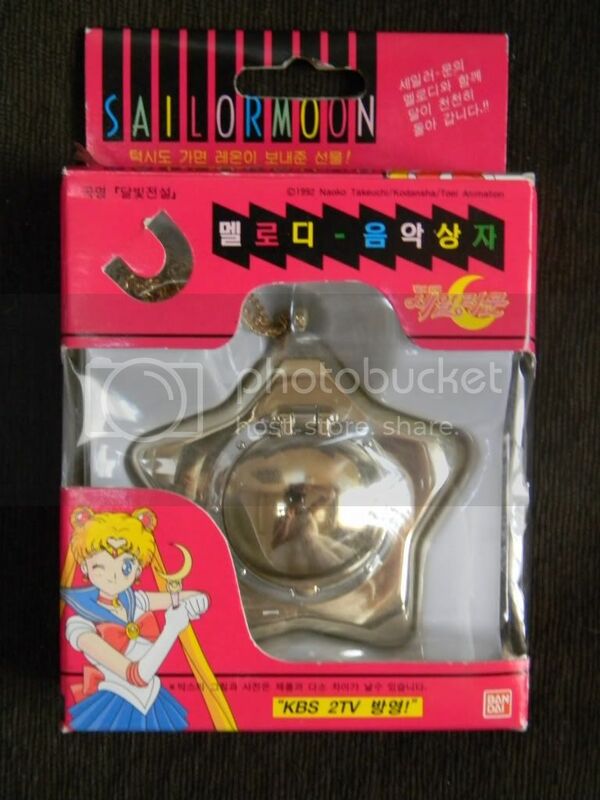 There is picture of Sailormoon on the front left corner of the box and a copyright along where her skirt is that says, "BANDAI 1992 MADE IN JAPAN." 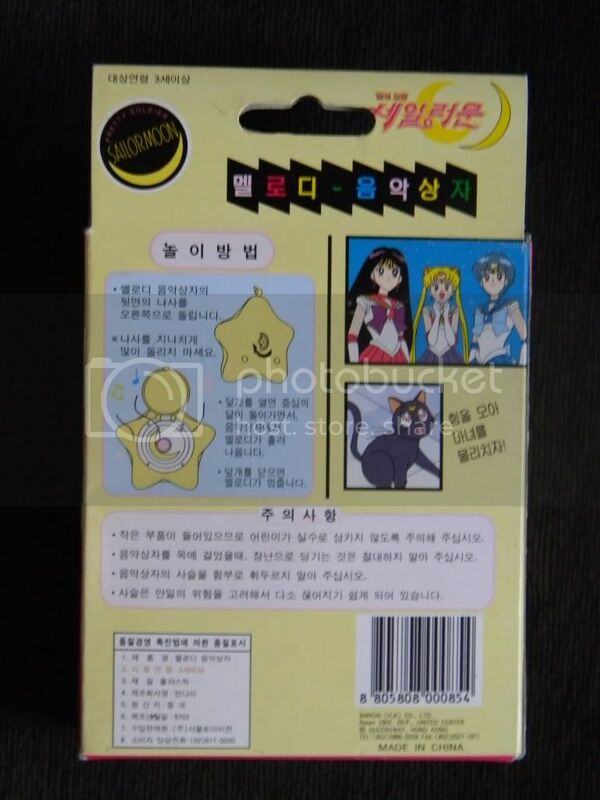 There is no box around this text - it has a slight white outline while it overlaps with the picture of Sailormoon. 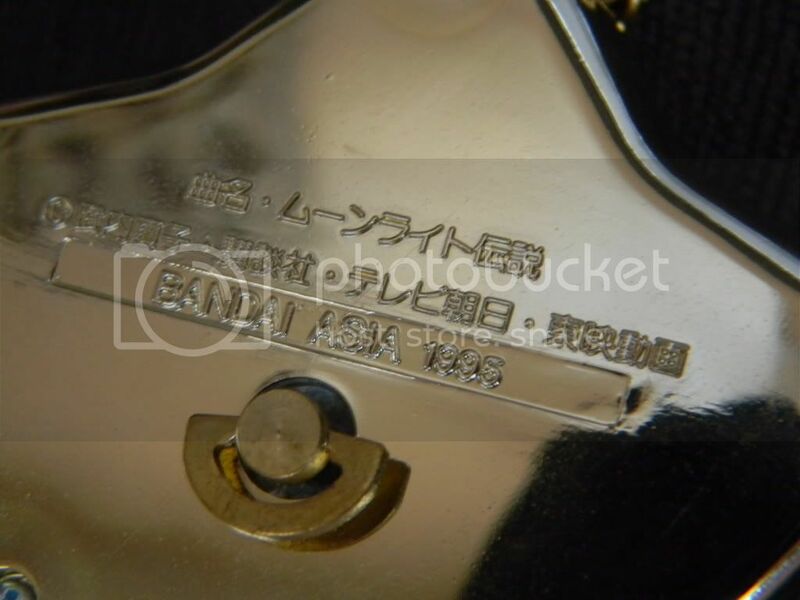 The back of the physical locket also says "BANDAI 1992 MADE IN JAPAN". No other gold version of the locket was made in Japan (we'll get to the pink one later). There are other Star Lockets w ith the 1992 date on it; here is one. The major difference between this locket and the original 1992 Japanese locket is that this locket says "BANDAI 1992 MADE IN CHINA" clearly on its back - not Japan. I owned one of these lockets for a while but it did not have a box. You can see in the image that this locket also has no "2" marking under the lid. It's color is also very gold when compared to the Hong Kong or European lockets. Because of the strong similarities with the original Japanese locket, I thought it was an original Japanese locket. However, I am now 100% convinced that this locket was produced separately at the same time as the Japanese locket. I have not come across this locket in a box yet so I cannot give details on what it might look like. Please note that the chain on the locket in this picture is not the original. See the following listing for more information. This locket is a candidate to be either of the two mystery Made in China 1992 lockets above. I was only able to located one photo of this locket. It appears to be in Spanish and I've been told on good authority (;P) that there is a Guadalajara in Spain. The box is fairly similar in proportions to the Japanese box. From this one photo it does appear that it might be slightly more gold on the surface than it is on the rim around the lid. It's hard to tell unless you can see the lockets side by side to make the comparison. I cannot verify what the back of this locket says, but the back of the box does have a 1992 date on it and it says it was made in China. If I could verify its color or if it has a "2" under the lid then I would figure it to be the same as one the lockets above. Of course, having a picture of the back of the locket would be ideal. Looking to credit these Spanish Locket photos! Please contact me if you know where the originals were from. I am unable to locate the original owner. The European locket might be lighter in color than the Japanese original. If so, then it's "gold" is much more muted, similar to the color around the lid of the original Japanese locket. I remember seeing it beside an original Japanese one and noticing the color difference, but I'd like to verify this again to be sure as I've also been told that it is gold like the original. Clearly the box for this version is very different. chelseacandy was kind enough to provide a picture of the back of her European locket. It reads "BANDAI 1992 MADE IN CHINA". She said it does not have a "2" under the lid. This verifies that the locket in Version 2a could actually be a European locket. All that's left in this case is to compare a European one to an original to check the color. It also means the the European locket and the Spanish edition might be the same locket in different packaging. The 1995 Hong Kong edition locket can easily be mistaken as a Japanese locket if you only see the front of the box. The box has a lot of Japanese text on it and looks very similar to the original Japanese box. However, there are some subtle differences. First, the front lower left of the Hong Kong box says "MADE IN CHINA" in a pink box. This is the most noticeable difference and the easiest one to spot even on small images. The back of the box clearly shows the company listing in the lower left corner as: Bandai Asia Ltd. Co. Hong Kong. Other differences include the text above the locket's name: on the Hong Kong edition it is smaller and written in English instead of the Japanese that is on the original. Also, the spacing is slightly different around Sailormoon on the Hong Kong box. Notice that there is almost one whole 'fist' length between Sailormoon's raised fist and the edge of the clear window to the locket. This is a much smaller space on the original Japanese box. This locket is most frequently mistaken for the Japanese original while in the box. When I bought my HK locket I believed it to be the original Japanese in the box because the seller listed it as such. I didn't know enough about the differences to see it. However, short of having the original, this is the box I personally like the most. This locket is slightly less gold than the original Japanese locket or the 1992 Chinese release. This photo shows a comparison between the HK locket and the 1992 locket that might be from Spain (Version 2a). The Hong Kong locket also has a "2" in the center of the underside of the lid. This is not present on the Original Japanese or the Version 2a release. This is my locket. The back of my locket says "BANDAI ASIA 1995". Because my locket does not have the Korean sticker on the back I am assuming the HK and Korean locket both have the same writing on the back. The sticker on the Korean one (see below) seem to be the only way to tell the difference if they are loose. This is probably the version of the locket that I see the most often. This box has Korean writing on it which looks quite a bit different from Japanese (even if you can't read it). Most noticable is the big yellow banner at the bottom. Here's a close up. 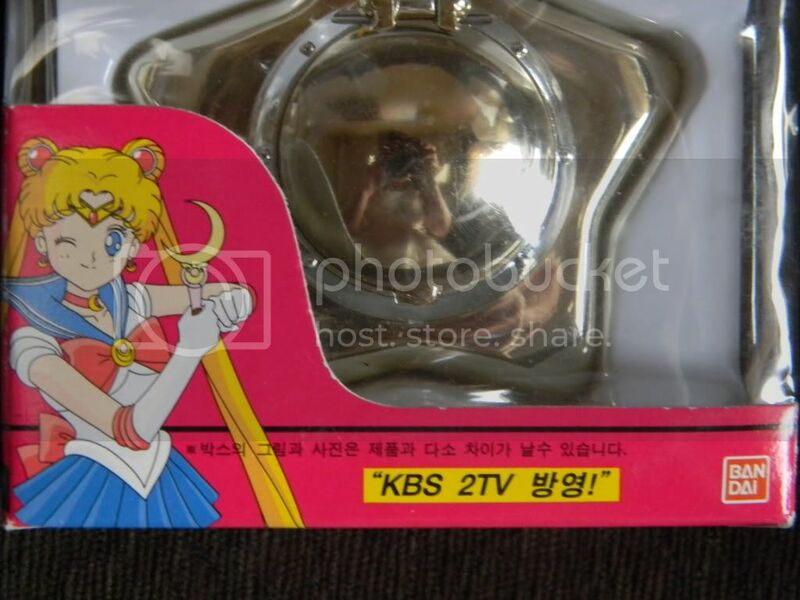 The back of the Korean locket says "BANDAI ASIA 1995". I have also seen some of the Korean lockets have a sticker on the back (photo from SaturnBunny) with Korean writing on it. You can see the same sticker on Super-Moogles's Korean locket here. The Korean locket also has the "2" under the lid. It is slightly less gold in color than the original. Following the R season release of the anime in Japan, Bandai produced another version of the Starry Sky Orgel. It was the same as the first but with one major difference: the body of it was pink instead of gold (the lid, for whatever reason, was still gold). The box is styled to match the R season toys, however the back of the locket says "BANDAI 1992 MADE IN JAPAN" even though it was released in 1993. This locket had a very short run and is considered to be a very rare item and highly collectible. This locket is unlikely to sell for less than $600, even loose. Where can I buy a Star Locket? How much does a Star Locket cost? If you want to make this awesome item a part of your collection then there are a few places you can look to find it. Occasionally it pops up on eBay either loose or in the box. You might also be lucky and find it for sale from a collector in person on YouTube or in a closed collection community like SeraSell on LiveJournal. Another place to keep an eye on is Yahoo Japan auctions. You cannot bid directly on these auctions so you will have to use a third party bidding site like FromJapan or Japanmart.